I just got this error running some AutoLISP code in AutoCAD 2014 that I know there is no error in. I tried to repair the AutoCAD installation but it did not help so I tried a reinstall instead and that solved the issue. I think this problem happened because I also have AutoCAD 2013 installed and applied the service pack to it after AutoCAD 2014 was installed. According to this update KB we can see what Autodesk says about if Autodesk products are supported on Microsoft Windows 8. Please check the system requirements for your product to verify compatibility and specific details (for example, some products are supported on the 64-bit version of Windows 8 but not the 32-bit version). Unless noted otherwise in the system requirements for an individual product, Autodesk 2014 products are supported on the Windows 8 operating system. For example I found that for example Revit Architecture for Citrix 2014, Autodesk Navisworks 2014, Simulation Moldflow 2014, Autodesk Maya 2014, Autodesk Inventor 2014, Autodesk Alias 2014, 3ds Max 2014, AutoCAD Civil 3D 2014, AutoCAD Plant 3D only mentions Windows 8 64-bit. But who would really use Windows 8 32-bit anyway? Microsoft Windows Vista: Here’s what Autodesk says: Beginning January 1, 2012, Autodesk will have formally ceased support of the Microsoft Windows Vista Operating System for all new (and upgraded versions) of its products and services released in 2012. Microsoft Windows XP: Why are you ending support for Windows Vista when XP, an older operating system, is still supported? Through Autodesk’s research and customer engagement, there is still a large population of customers utilizing this Operating System in their work environments. We will work with our customers in the coming 12-24 months to understand their transition plans and make a support decision about Windows XP when it is appropriate to do so. Yes, VBA is still available for AutoCAD in the latest 2014 even though it was not supposed to. 64bit VBA (Visual Basic for Applications) is finally also available in 64-bit for AutoCAD. The performance problems, with previous releases of 64bit AutoCAD when using VBA, should be now be gone. Note that 32bit VB6 controls will fail on 64bit. The version of VBA that is available for AutoCAD 2014 is VBA 7.1. Microsoft has introduced two new conditional compilation constants: “VBA7” and “Win64”. The Win64 constant enables a separation between the 32 and 64 bit version of VBA and can be used to ensure that code is only executed when VBA runs in the correct mode. For AutoCAD 2014 64-bit VBA is not supported on Windows XP Professional. Find the VBA for AutoCAD downloads here at http://www.autodesk.com/vba-download. For reference these resources can be helpful: Compatibility Between the 32-bit and 64-bit Versions of Office 2010 and 64-Bit Visual Basic for Applications Overview. Previous post Learn how to migrate from VBA to .NET for AutoCAD, VBA 7 for AutoCAD 2012? and VBA Download for AutoCAD 2013. Sometimes it can still make sense to migrate from VBA to .NET for AutoCAD and JTB World provides this service. Welcome to contact us with your needs. AutoCAD 2014 will soon be available and you might wonder what’s new. Yes, the command line does not go away soon, but rather has been improved quite a lot with AutoCorrect, AutoComplete, Adaptive Suggestions, Synonym Suggestions, Internet Search and more. Unfortunately not everything is yet included if you prefer to use the dynamic input only. Remember AutoLISP and VBA Security Controls in AutoCAD 2013 SP1? Further work has been done to improve on the security to avoid DWG viruses, AutoLISP worms and the like. Finally file tabs are included in the core. Design Feed, accessible from the Autodesk 360 ribbon tab, displays a palette in which you can enter text messages and attach images to be shared online with colleagues, clients, and consultants through Autodesk 360. Posts appear with related drawings on the desktop, on the web, and across mobile devices. Support for Geographic locations has been significantly enhanced. It includes the same Coordinate System Library as AutoCAD Map 3D and new Autodesk Live Maps. Reality Capture enables you to take a 3D laser scan of an object, topography, a building or even an entire town and attach it to an AutoCAD drawing as point cloud data. You can then use it as a real‐world reference for your design work. This point cloud data is stored as thousands, even millions, of points in 3D space. Point cloud functionality is enhanced in AutoCAD 2014 to support inserting of Point Cloud Project (RCP) and Scan (RCS) files produced by Autodesk ReCap. Finally there are also several minor updates like Arc Creation, FILLET and CHAMFER on Polylines and Xref Manager. AutoCAD for Mac 2014 is not yet available. Most of JTB World’s software just works with AutoCAD 2014 with no upgrade needed. FlexNet version and version of all .exe files is 11.11. Autodesk IPv6 Network License Manager for Windows supports mixed IPv4/IPv6 and IPv6-only environments. It does not support network license checkouts in an IPv4-only environment. If you have multiple servers you can install on one of them and then grab lmtools.exe, lmutil.exe, lmgrd.exe, and adskflex.exe and copy to the others, just stop and start the FlexNet services in between. Upgrade your license servers if you plan to support Autodesk’s 2014 products. JTB FlexReport fully supports Autodesk Network License Manager and usage monitoring of all products licensed with FlexNet including version FlexNet 11.11. For the FlexNet (FLEXlm) executables there is a newer version available FlexNet 11.11.1. Autodesk has announced their 2014 portfolio of tools for design, engineering and entertainment and they invite you to join for a special webcast on March 26, 2013 at 8am Pacific, 11am Eastern, 3pm UK and 4pm Europe to learn more. Via In the Fold. BTW. Check out the new look on Autodesk’s website. Autodesk focuses a lot on suites so some products are only available as part of a suite like for example Revit. SAN FRANCISCO--(BUSINESS WIRE)--The new Autodesk, Inc. (NASDAQ: ADSK) Design and Creation Suites offer unprecedented access to the Autodesk 2014 software portfolio spanning the desktop and cloud and allow building, product, plant, and factory design; engineering, construction and infrastructure; and entertainment creation professionals to innovate more. For the first time, the 2014 Design and Creation Suites include new reality capture software and services that more easily incorporate both laser scans and digital photographs of the physical world into the 3D design and engineering process. The flexible, economical software access provided by Autodesk Suites means designers and engineers have a broader palette of tools to choose from — they can choose the best tool for the job at hand and better respond to changing business requirements. Suites customers on Autodesk Subscription will also have access to select Autodesk 360 cloud services that extend designers and engineers’ workflows to explore more design alternatives, collaborate more effectively and experience greater mobility. Subscription customers now can purchase additional cloud capacity as well. A key addition to the 2014 portfolio of suites is Autodesk ReCap, a family of new reality capture software and cloud services that simplify the process of creating intelligent 3D data of physical objects and environments using laser scans and photos, allowing customers to bring the actual job site or physical objects into their design and engineering process. Rather than beginning with a blank screen, designers and engineers can add, modify, validate and document their design process in context. For example, a civil engineer can bypass an existing bridge or expand the road underneath digitally and test feasibility with accurate survey data. At construction phase, builders can run digital clash detection to truly understand if existing utilities will be in the way. Urban planners can get answers to specific design questions about large areas, such as how much building roof surface is covered by shadow or vegetation. The 2014 suites’ industry specific workflows address specific user needs and strengthen compatibility between products. For example, suites containing Autodesk Revit products and Autodesk AutoCAD software enjoy tighter interoperability so when it is time to import forms from AutoCAD into Revit products, the forms retain much greater integrity, or when it is time to output drawings in AutoCAD, users can generate 2D documentation within Revit products. Suites containing Autodesk Revit and Autodesk Inventor software will benefit from tighter interoperability that allows customers, such as building product manufacturers, to simplify and export an Inventor model into a Revit file format for the construction environment without exposing any sensitive intellectual property. Autodesk 360 extends the suites workflow advantage by connecting the desktop to secure and virtually infinite computing power in the cloud, helping subscribers rapidly design, visualize, simulate, and share their ideas anywhere, anytime. Illustrating the power of a combining the cloud and desktop, Autodesk Infrastructure Design Suite 2014 and Autodesk Building Design Suite 2014 introduce Autodesk InfraWorks software and Autodesk InfraWorks 360 cloud services. These new tools help accelerate the adoption of Building Information Modeling (BIM) and cloud-based workflows for the planning, design, construction and management of civil infrastructure projects. Helping improve the civil infrastructure design process by engineering in 3D from the start, the software and services allow collaboration with a broad set of stakeholders on mobile and desktop platforms, and enables communication in new and visually compelling ways. Autodesk InfraWorks allows civil engineers and planners to design within the context of the real-world environment, helping to deliver projects, both large and small, by more efficiently managing even large-scale infrastructure models. Standard editions of all suites containing AutoCAD have added AutoCAD Raster Design software. Autodesk Building Design Suite subscribers gain access to Autodesk Green Building Studio and energy analysis cloud services in the standard edition, as well as InfraWorks 2014 and the Optimization for Inventor cloud service in the Ultimate edition. Autodesk Entertainment Creation Suite customers will benefit from new workflows like the ability to easily generate moving or idle crowds with populate, improved viewport display and shading, and the ability to create production-quality meshes with the new retopologizing options. Autodesk Factory Design Suite includes more than 300 new factory assets. Autodesk Infrastructure Design Suite Premium now includes Autodesk InfraWorks 2014, Autodesk Roads and Highways Module for InfraWorks, Autodesk AutoCAD Utility Design software and for the first time, a single, comprehensive version of Autodesk Revit products that combines tools for architectural design, mechanical, electrical, and plumbing (MEP) engineering and structural engineering. Autodesk Plant Design Suite Ultimate adds Autodesk Inventor with Routed Systems, and the Plant Design Suite Premium edition now includes Autodesk 3ds Max Design software. Autodesk Product Design Suite Premium now includes Autodesk Inventor Professional, and Autodesk Navisworks Manage has been added to the Product Design Suite Ultimate edition for clash detection. Both Product Design Suite Ultimate and Premium customers on Autodesk Subscription now have access to the Optimization for Inventor cloud service. Availability varies by country. Suites customers on Subscription have access to select Autodesk 360 capabilities, and subscribers can purchase 100 additional cloud credits for only $100. See details and purchasing options at http://www.autodesk.com/purchaseoptions. Windows 8 comes with a completely new Start screen that replaces the start menu. After having tried some freeware that try to mimic the old start menu (that I were not that satisfied with) I have instead started to use the Start Screen and even though I don’t have a touch screen I find it quick and easy to use. In Windows 8 you can by default pin only some things like programs (.exe) to the Start screen using Windows Explorer. But what if you want to pin a document? It can be done with a simple registry hack. Here is how I right-click on an Excel document and have the Pin to Start option. When ready you will find the document or file as a tile on the Start screen. Copy the text in the box below into Notepad and save it as pintostart.reg. Then double click on pintostart.reg and accept the dialog boxes. Only thing is that you need to also pin it. Say you create a shortcut named “Windows 8 manual test” and put it in the folder above. Now press the Windows button and start writing the name of the shortcut and it should show up in the search result. Right-click on the shortcut and select Pin to Start at the bottom of the screen and the tile should show up on the Start Screen. I have not tested this app but it looks like it’s pretty easy to use and could be useful if you want drawings of existing buildings. DXF file, PDF document, JPEG images and a web site with an interactive floor plan. MagicPlan requires gyroscopes available only with iPhone 4, 4S, the new iPod Touch, the iPad 2 and the new iPad. If you have tried it please comment below what you think about it. 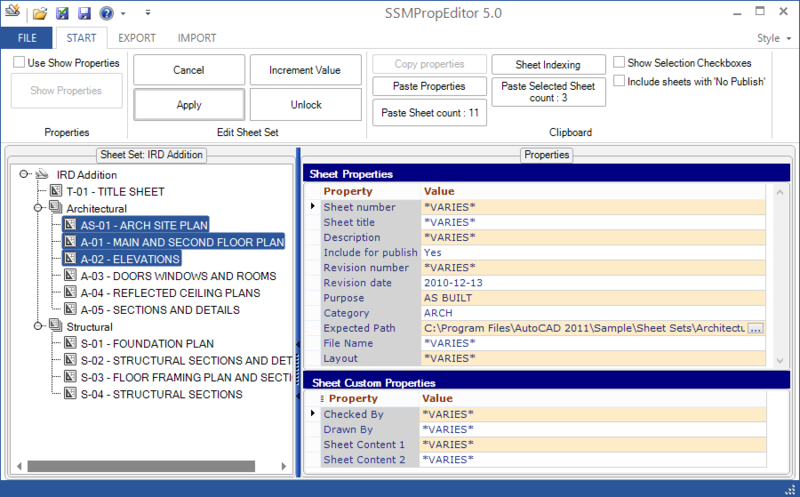 SSMPropEditor is the Sheet Set Manager Properties Editor for AutoCAD based products and SSMPropEditor 5.0 is now available and comes with the addition of localization for Italian, direct export and import to and from Excel and more. The upgrade is free for customers that purchased an earlier version. SSMPropEditor as AutoCAD app will be available later this month. See also SSMPropEditor 4.6 released and SSMPropEditor as AutoCAD app. The updated FlexNet (FLEXlm) version (based on Flexera Software’s FlexNet Publisher Licensing Toolkit 11.11.1) was released in February 2013 and is now available as a public download as well as the updated License Administration Guide. No words about if there are any bug fixes but if you experienced unknown problems with the license manager it can be worth trying to update. lmgrd.exe, lmutil.exe and lmtools.exe are all 11.11.1 now. Previous FlexNet Version 11.11 described. JTB FlexReport license monitoring tool has been tested with and supports this new version.